Many times in mathematics, we will often end up with decimal answers when solving for a missing side by applying the Pythagorean theorem. 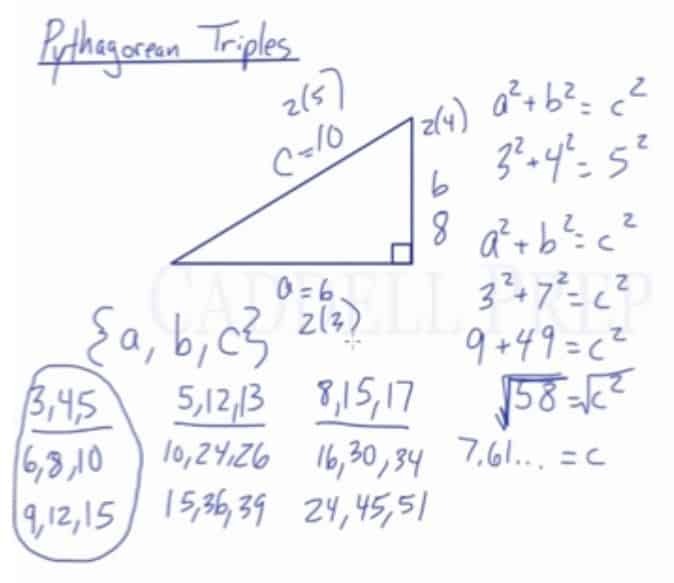 Pythagorean triples, however, are whole numbers. Knowing these will save a lot of time by eliminating the need to use Pythagorean theorem every time. Let’s go over Pythagorean triples. Sometimes we’re doing Pythagorean theorem and searching for one of the sides and we end up a decimal answer. Only select integers work in here. But it would be different if we have different numbers. Here, we did not get an integer answer. We’ll only get an integer when we get a square root of a perfect square. Like square root of 49, square root of 64, square root of 144, all of those will give us an integer. Pythagorean triples are a group of integers that work in this perfectly. These are not the only Pythagorean triples. There’s a lot more. We can list some of them based on these triples. We can just multiply these by any integer and we’ll get another triple. If we take multiplied by , we’ll get which is another triple. When multiplied them by , we’ll have . We can double them into and when multiplied by we’ll get . We can also double and get . Let’s triple it we’ll have . These are the most common ones we’re going to see. The reason why we need to know these is it can save us some time writing the Pythagorean theorem. For example we have and , we know that this is just a triangle multiplied by . Here, we know that . Sometimes, knowing these triples could save us from doing Pythagorean theorem. But of course, if we know that one side is and the hypotenuse is , we can find the missing side just by using Pythagorean theorem as well.